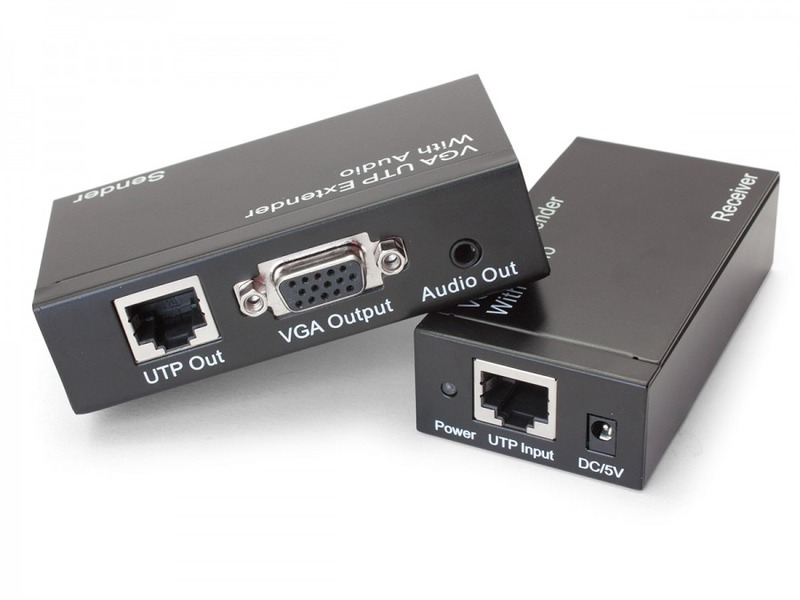 Duplicate and Extend VGA + Stereo Audio up to 300m the easy way - over Cat5! This VGA Over Ethernet Extender & Splitter offers local VGA duplication via a VGA output on the Sender unit, and VGA extending over a single CAT5e or CAT6 cable to the Receiver unit. Video and Audio are supported for both the output from the Sender unit, and over Ethernet on the Receiver unit. Depending on VGA resolutions required, this high quality extender can send your signals hundreds of metres. This package includes both the VGA Balun Sender & Receiver, and their respective power packs. You will require VGA, Ethernet and 3.5mm Audio cables to suit your installation setup. Running VGA more than about 15 or 20 metres usually leads to a trade-off in picture quality or resolution capability, but with a fully powered extender kit, you can have both local viewing and remote display running simultaneously up to 1920x1200 resolution. Audio is also included as a 3.5mm socket for remote transmission. Please note left and right channels are combined to a mono audio output. Both the transmitter and receiver have their own Australian power packs, and the receiver also has Peak and Gain knobs (screwdriver required for adjustment) so you can dial in the best picture possible for the length of RJ45 UTP cable you're using. For VGA over a long distance, this is the way to go. Note: UTP cable is not included. 12 Months Cable Chick Warranty! Note: Mono audio output only. Left and Right channels are combined. Cable Chick Tip: This package does not ship with CAT5 cables, VGA cables or Stereo Audio cables. If you need them, please check out my CAT5, VGA and Stereo Audio categories right here at Cable Chick! Answer: "These work with standard Cat5/6 UTP. Crossover cables will not work."